Individual rooms at Cronkhite Center are furnished with one twin bed and mattress, one mattress cover, two chests, one mini refrigerator, one file cabinet, one wardrobe, one bookcase, one desk, one chair, one lamp, and a box fan. Linens are not included. See a list of all furnished units in the Harvard University Housing portfolio. 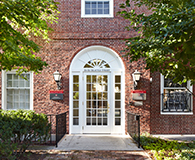 View the Cronkhite Graduate Center welcome information. NOTE: Cronkhite Graduate Center cannot accommodate air conditioners in individual rooms. Central air conditioning is provided only in the basement and first-floor common areas during the cooling season, May 15 through October 31. Cronkhite Graduate Center has a House Loan program in which includes the items listed below. Please be aware that they may might not always be available when you need them. Visit the Property Management Office during regular business hours to sign out a vacuum cleaner. The iron and ironing board are located in the laundry room, and should remain there. All ironing should take place in the laundry room. Harvard University Housing does not manage any parking facilities. Parking for residents is available, for a fee, through Harvard University Parking Services. For more information, go to their web site; call 617-496-7827; or visit the Campus Service Center. Please view the City of Cambridge Parking website to learn about resident and visitor parking restrictions. Harvard University Housing's furnished apartments do not include linens, dishes, pots/pans, or cutlery. Furnishings differ by unit size and type. Please view our list of furnished units for more information. Harvard University Housing is dedicated to continually fostering a community of sustainability by improving the efficiency of its buildings and providing residents with the tools and resources to reduce energy and conserve resources.